90 lenses per box @ $48.52 per box. Minimum order 2 boxes (three months' supply). 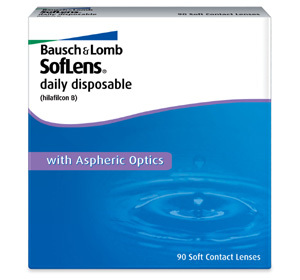 The replacement for Bausch & Lomb's long-standing daily disposable, the Soflens One Day. The new Soflens Daily Disposable brings with it both Bausch & Lomb's High Definition Optics, an aspheric lens design which reduces spherical aberrations to give exceptional vision in all lighting conditions, and its ComfortMoist Technology, a thin lens design combined with a slow-releasing moisturiser to provide outstanding all-day comfort.